An heroic Chinese father sacrificed his life to save his son by pushing him to safety from the path of a lorry. 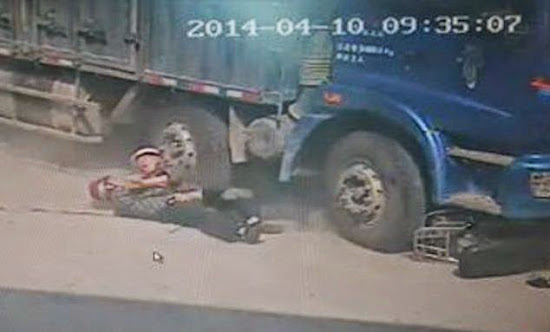 Hsiung Kuo rolled his son Yong away from the wheels of the truck moments before the same vehicle crushed him to death in Quanzhou City in southeastern China. Police say the pair had been traveling on an electric scooter with Yong, 47, driving his 71-year-old father into the city, in the Fujian Province of the country. CCTV images show the pair stopping briefly at a crossing as a lorry comes into shot. But as the truck smashes in to their scooter, the father bravely grabs his son and pushes him away to safety. Even as the lorry ran over his legs, he was still trying desperately to push Yong away from danger. Seconds later the father's chest was run over, killing him instantly. The harrowing images were taken over a period of just seconds. Medics arrived shortly after, but he was declared dead at the scene while Yong was consoled by emergency crews and treated for shock. The truck driver, who reportedly ran from the scene of the accident, has been arrested while police investigate the death.